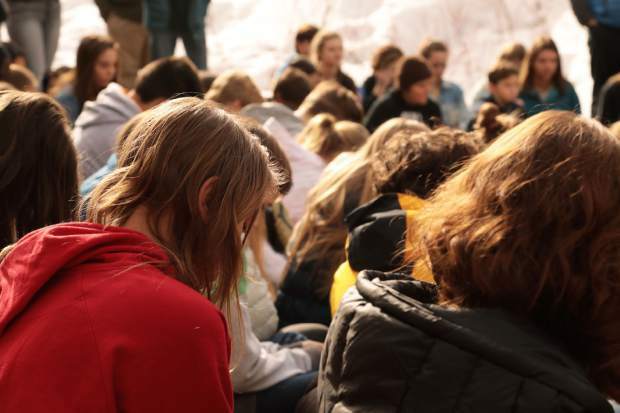 Vail Mountain School students, faculty and parents gathered outside the school and observed 17 minutes of silence in memory of the 17 victims of the Marjory Stoneman Douglas high school shooting in Florida. 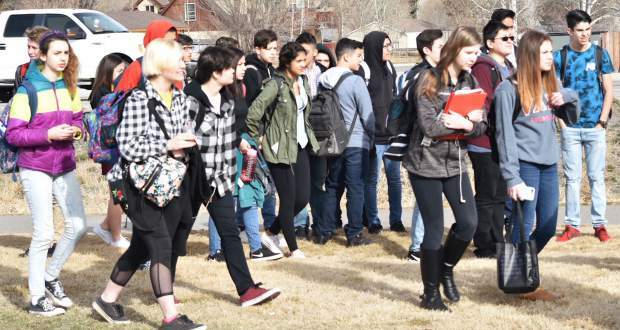 Hundreds at Battle Mountain High School participated in Wednesday's walkout event. 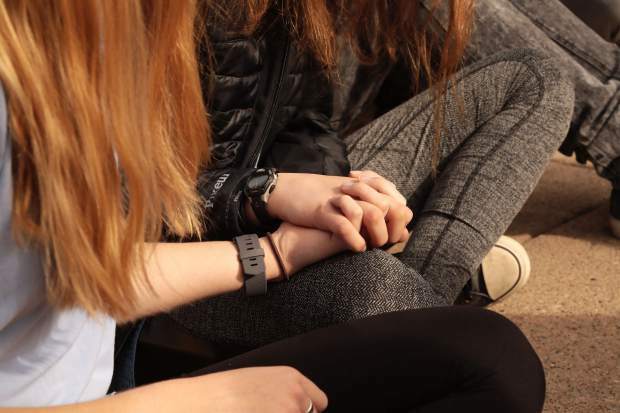 Two Vail Mountain School students hold hands in silence during the student-organized walkout. Students called for measures to make schools safer. Eagle Valley High School's Riley Dudley read a lettter signed by hundreds of students, demanding action from elected officials. 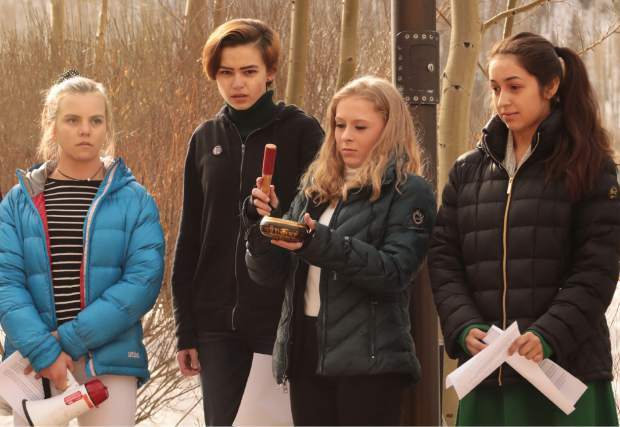 Vail Mountain School senior, Christie Spessard, strikes a Tibetan singing bowl to mark the beginning of 17 minutes of silence observed in memory of the 17 victims of the Marjory Stoneman Douglas high school shooting in Florida. 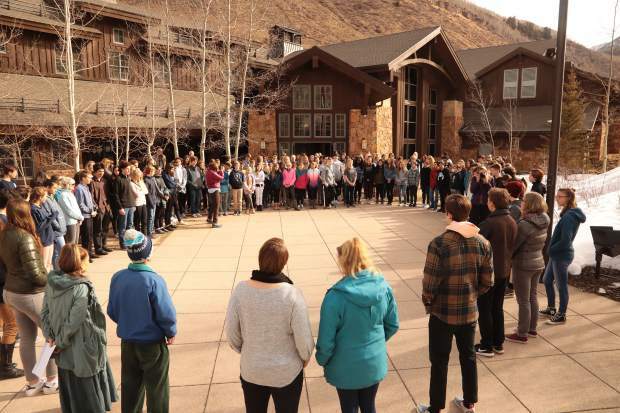 Spessard and Mel McCalley, to Spessard's right, organized the walkout at Vail Mountain School. 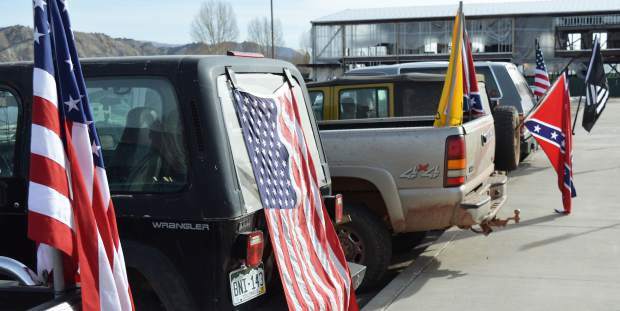 Flags and symbols of all sorts found a peaceful home during Wednesday's walkout. 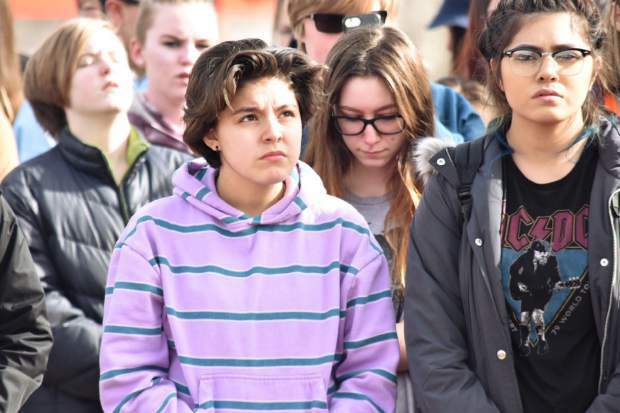 Hundreds of students up and down the Vail Valley walked out of class Wednesday morning, March 14, and stayed out for 17 minutes one minute for each victim of last month's school shooting at Marjory Stoneman Douglas High School in Parkland, Florida. 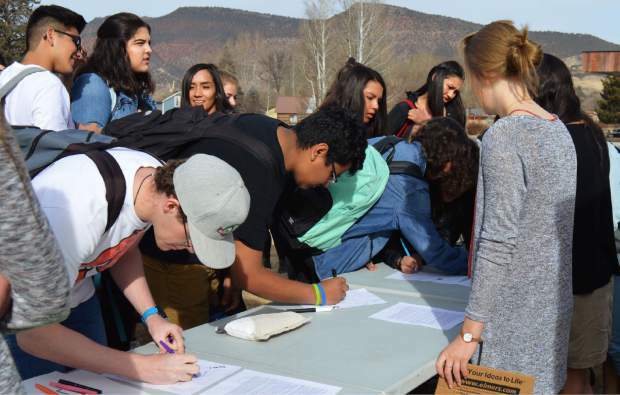 Hundreds of students signed a letter to be sent to elected officials around Colorado and the nation, demanding action for safety in their schools. Hundreds of Battle Mountain students participated. The walkouts were peaceful and free of an incidents. 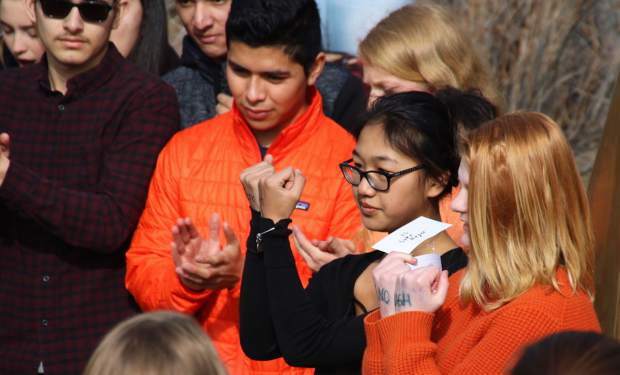 VAIL — More than 200 Vail Mountain School students, teachers, faculty and parents reflected silently at the National Student Walkout on Wednesday, March 14. VMS junior Mel McCalley and senior Christie Spessard organized the event. 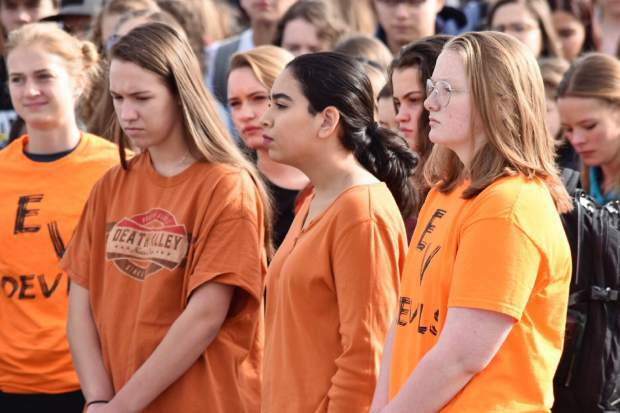 When the Parkland incident occurred, McCalley emailed Spessard and suggested the walkout. While other schools chose to march, VMS sat. 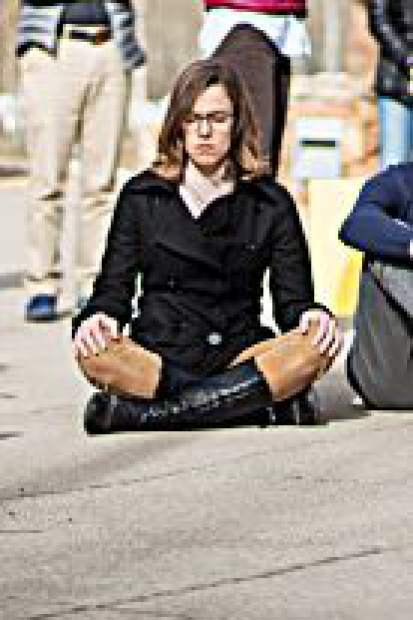 “I think sitting is a little less divisive than actually marching with signs. 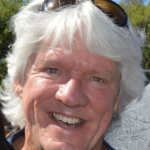 Some people have very strong opinions, and we want everyone to come together,” McCalley said. During the somber 17 minutes, students hugged, held hands and shed tears. Spessard rang a Tibetian Singing Bowl to announce the end of the 17 minutes. 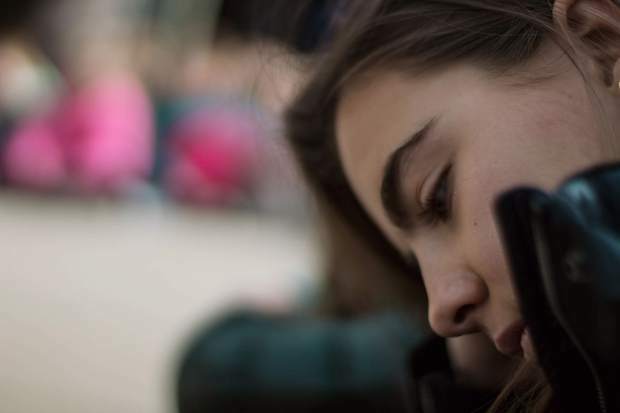 “We hope that this time has helped you to reflect on the seriousness of the issue of school shootings in the United States,” Spessard said. “I believe that we can all agree upon the fact that something must be done differently in our country so that children are safe at school, and so that Americans don’t have to live in fear. Following the walkout, Spessard, McCalley, Hardenbergh and senior Alicia Chavez gathered for a roundtable discussion about mass shootings and schools. “After the Vegas shooting, I was really affected in a different way than I had been with other shootings,” Spessard said. EAGLE — Our children practice lockdown drills the way their parents and grandparents practiced duck-and-cover drills. For parents and grandparents looking back, it may seem the same. The notion of a nuclear attack was remote. 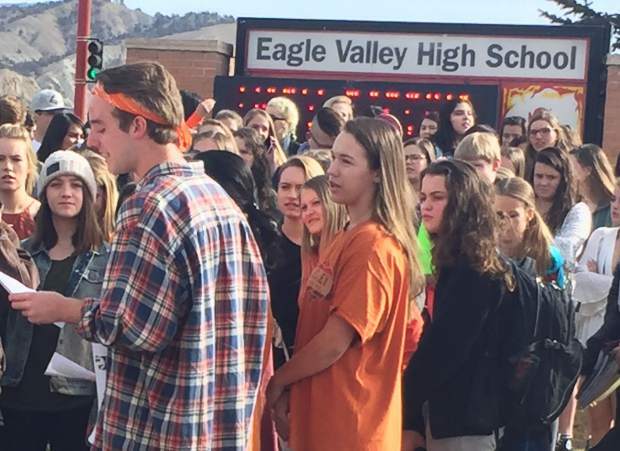 Hundreds of Vail Valley students joined millions nationwide, exclaiming “Enough!” and walked out of class for 17 minutes Wednesday, one minute for each of the 17 victims of last month’s school shooting in Florida. 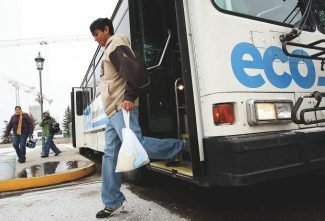 They grew up in the wake of the Columbine massacre, where two students shot and killed 15 people. 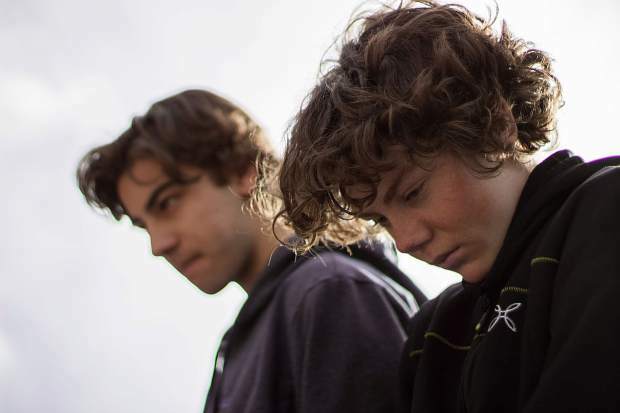 Last year, Columbine dropped off the list of America’s deadliest mass shootings. This is more than frustration, more than fist shaking, they said. “Things feel different. … We want to make it known that something does need to change, so that our children, 10 or 20 years down the line, don’t have to go through this,” Dudley said. Florida’s Marjory Stoneman Douglas High School was the most recent and sadly will likely not be the last. 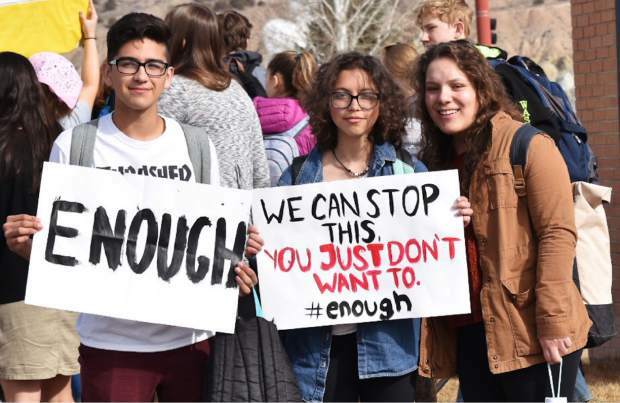 “There will most likely be another school that makes national headlines because events like this have become commonplace in our society,” said Dudley, reading a letter signed by hundreds of local students to be sent to elected officials across Colorado and Washington, D.C.
“When did we as a society decide that this was acceptable … that it was acceptable when a community suffers such a tragic loss?” Riley asked. 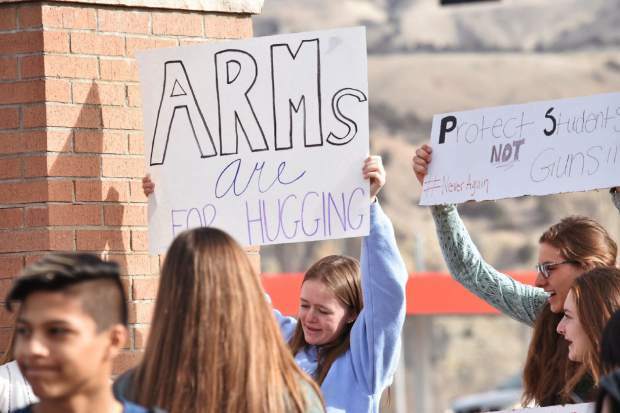 Battle Mountain sophomore Troy Rindone called for gun control. “No one should be able to buy a gun that can kill hundreds of people in minutes,” Rindone said. “We live in a developed country and my parents have to worry about me coming home each day. 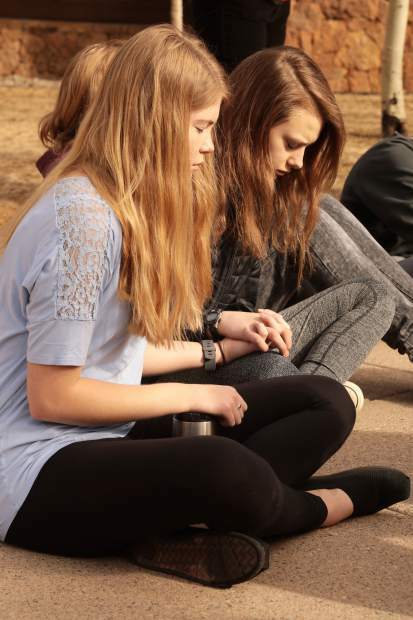 Students who have experienced a school shooting are angry. Parents who dropped their child at school and were never able to pick them up are angry. “I do not want Battle Mountain High School, or any other high school, to be just another name shown on the news at the end of the year. The walkouts were peaceful and free of incident. Local law enforcement made sure the public was kept well clear of the students. Vail Christian High School’s contingent was around a dozen. They quietly and reverently left class, heading back 17 minutes later. 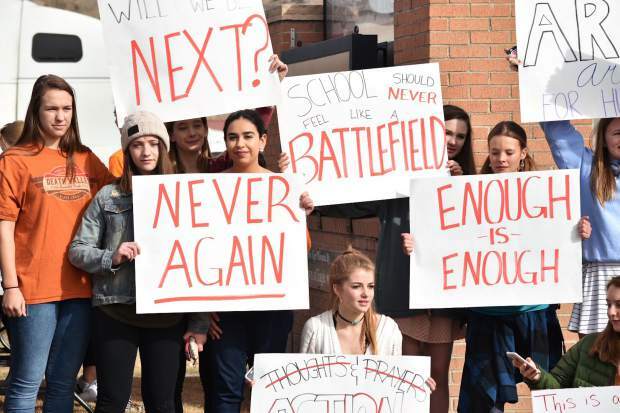 At Eagle Valley, a group of students advocating for their Second Amendment rights demonstrated around the corner of the school building. Eagle Valley junior Hunter Jaramillo said the conversation is shifting to Second Amendment rights, instead of the mentally ill people who sometimes use them for heinous purposes. They all stood on common ground Wednesday. “It is our right to feel safe at school,” Riley said.